« Your next chance to win tickets to It Might Get Loud: Tonight at 5 p.m. Watch The Twitters. Meetings: They consume time, they consume thought processes and they have, at least lately, consumed our gnatlike attention spans. 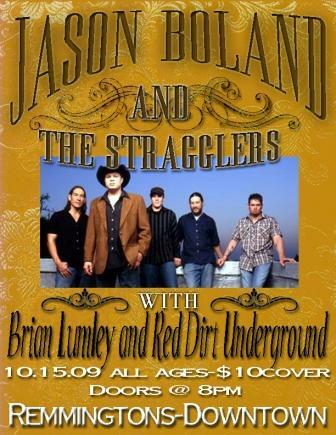 So with the recent flurry of meetings we’ve had to sit through we’ve whiffed on a potentially big show: Jason Boland & The Stragglers, longtime faves of Snorty Horsers (can we adopt that phrase instead of “Red Dirt country lovers?” The latter phrase feels a little tired. Topic for another time; got it), are back in Springfield Thursday, October 15 (also known as tomorrow night) for a show with opener Brian Lumley & Red Dirt Underground. The all-ages show starts at 8 p.m. and costs $10 to get in. Of course, you could have learned all of that by reading the adjacent show poster, but we’ve neglected enough already. This entry was posted on October 14, 2009 at 3:24 pm and is filed under Looking Ahead, Shows. You can follow any responses to this entry through the RSS 2.0 feed. You can leave a response, or trackback from your own site.